So @EMillerMP as lost in data as she is in geography. 2 data points do not define a trend. Time for @danielbowen to start campaigning. Funny thing is, my records show punctuality was actually lower than Ms Miller quoted in November 2010 — at just 73.5% (arrivals within 5 minutes). I suspect she was looking at the November 2011 figure. Here’s the period in question on a graph, with a trend line added. So yes, the trend is up. But there’s a problem with the Coalition claiming credit for it. The biggest boost in punctuality in mid-2011 was when a timetable re-write was introduced, separating out most weekday services from the Dandenong line. It also cut the myriad of stopping patterns. But that timetable was largely prepared while Labor was still in power. The other relevant changes during the Coalition’s term (apart from very welcome boosts in weekend frequency) were timetable tweaks providing a longer running time on the line (in some cases leaving multimillion dollar trains sitting idle waiting for the timetable to catch up), and Metro’s new habit of skipping stations (either bypassing them completely by running direct instead of via the Loop, or running express where scheduled to stop) to catch up time. Metro would claim that this is to keep trains in position by ensuring one service delay doesn’t cascade into the next, but on occasions they have been found to be doing this where it didn’t make operational sense — such as this example, where an evening shoulder-peak train was altered to stop at just a handful of stations, despite plenty of trains being available for its return run. 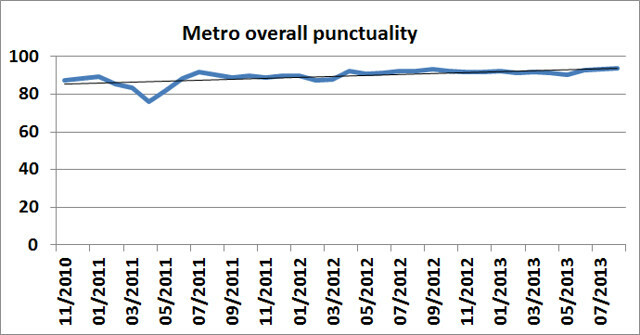 So overall, there’s no denying the punctuality stats have improved since November 2010. 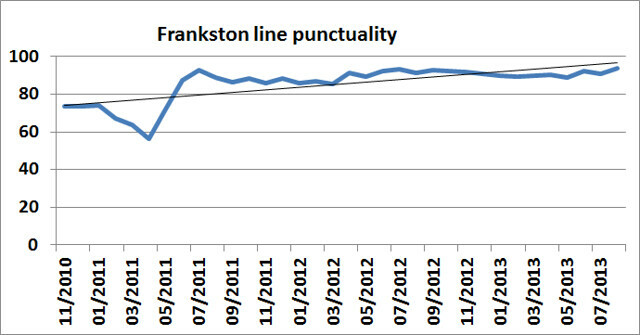 But what about a graph of that other big election promise for the Frankston line? Not so impressive. Today’s Age reports some progress, but with no station now expected until 2016/17, and a question mark over the facilities it will provide, clearly there’s a way to go. ← Previous Previous post: 5 varieties of ham – all with identical nutritional values? Ha ha! 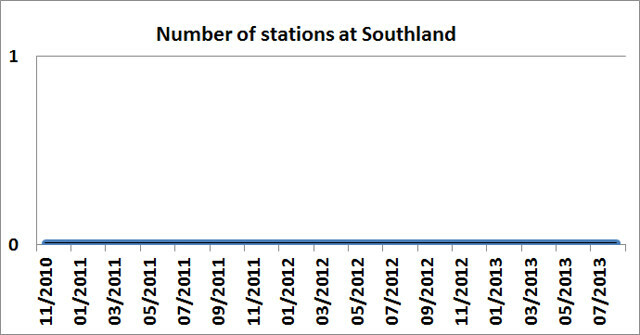 Love the Southland Station chart. Of course it’s no surprise that a government claims credit for something that was arranged when a different mob was in power. Likewise, I love the Southland Station chart! Sad news only this morning. The Southland station may not be built for quite some time? ++Build one of those large sheds over the railways, that gets you all over cover. So cheap that many private persons have them. ++On each platform, put one of those little public toilets we see all over now days. And oh, little bits here and there such as MyKi PIDS and more. Should have change out of a mere $5,000,000. Brilliant it would be to ride that express train. 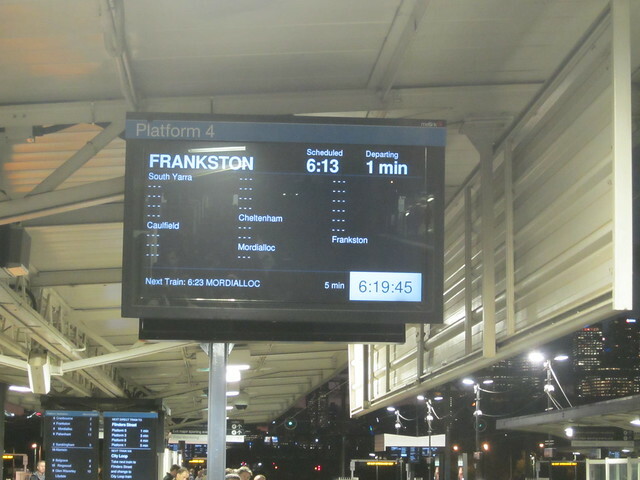 Love to have some Pakenham trains run express to Dandenong. One thing that has always puzzled me is how the few stations that do get built end up as real Taj Mahals (not always done properly either). Case in point is Laverton, Williams Landing, Thomastown and others built around this time; while proposals like Southland are cut down so much, major interchanges like South Yarra and Richmond are left in atrocious conditions. Surely instead of spending vast amounts of money on a few very grandiose, and dare I say, excessive stations – the funds ought to be spread around more reasonably. @Campbell – another way to look at thing is that stations like Williams Landing, Thomastown, etc are the way things should be, and that the real issue is why our existing facilities are run down dumps. Is it a better strategy to build things right the first time, and depriving existing facilities of much needed upgrades? Or is it better to build new stations down to a cost, leaving the extra funds to upgrade what we already have? With government spending it appears you often better off asking for the world, missing out on some of it, but still achieving most of your aims. The other strategy requires you to go back, cap in hand, to get the funding to do you didn’t ask for. It must be said, that having a platform for trains to stop at, is such a leap forward that, having just that can not be ignored. I went to Gowrie Station yesterday and noticed the fence was made out of steel rails (from old or spare railway tracks). It is a great example of the “made do with less” attitude that people had in the past. No wonder stations cost so much these days. So many things are unnecessarily custom made. Look at Epping Station now, angular shapes that cost a packet and even the roof has wooden panelling. I think you should run for office. I think you’d make a great prime minister. A large part of the cost is, unfortunately, driven by disability rules. Or what are claimed to be, disability rules. And then, the architects’ egos.